Every weekend at ELAM there are one or two galas. These galas are chances for different countries and regions of the world to highlight their culture, but basically boil down to a bunch of dancing routines that are (usually) executed really well. I often wonder: If everyone spent as much time working towards providing health care for the poor as they spend on dance practice if we couldn’t make progress in the former proceed a bit more quickly. I especially wonder this when walking back from using the internet at 4 a.m. and seeing exhausted students practicing all various forms of dances. Considering most students at ELAM are from 18-19 years old the ritual of the gala has important social significance. Pre-med students are expected to do a lot of work for the gala because their school work is much less demanding. I suppose a lot of strong friendships and grudges are formed though preparing for the galas. Leaders assert themselves and some sort of social order develops out of the chaos of teenage hormones. Galas take place at the Polígono. The Polígono is the all purpose outdoor stage/study area/sports viewing stand facing the Straits of Florida, only about a football field away. Usually countries invite their diplomatic representatives to come on out to the show, and they usually show up. So there are chance to rub shoulders with pretty interesting visitors, especially since the galas get sort of boring after about an hour (they can last up to 3!) Attendance is not required. The U.S. Gala went off a couple of weeks back. I included a picture above. The theme was the Wizard of Oz and the storyline reflected the four regions of America and the contributions of immigrants to each region. At the same time it talked about how America isn’t the immigrant’s paradise it is made out to be. Or something like that. I actually left an hour into the thing because I had work to do. 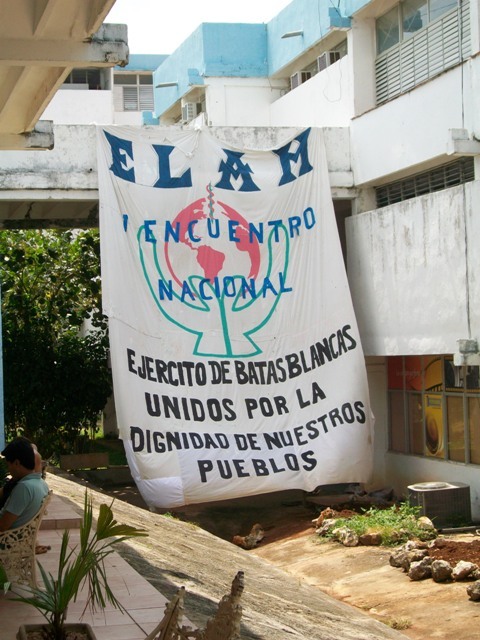 But there was a large crowd because the first annual ELAM national congress was taking place.